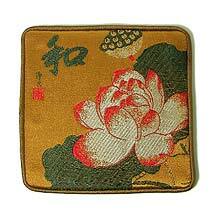 A set of four beautiful Chinese style brocade coasters with Lotus flower embroidery. Come in a decorated box. On the top left of each coaster is the Chinese character "Peace". They are a great way to welcome guests!